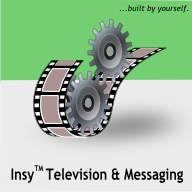 Now you can publish video clips to your followers or watch funniest video clips on your Nokia phone with Insy Television & Messaging app.It also provides free video messaging from mobile to mobile phone. This is the first implementation of a nonlinear signaled television system. It can be a mobile TV solution, a self-casting application or a simple live video messenger. Download and enjoy this Television and messaging mobile app for free from ovi store.